Placing Items Outside to Kill Bed Bugs? Bed bugs, like any living organism has a thermal death point and a low-temperature range, which they can’t withstand and will kill them. Let’s say, you and I took an outside adventure in the Mojave Desert at 120° As humans we too have a thermal death point and low-temperature tolerance level. Before the day is up, both you and I would be suffering from heatstroke or hyperthermia. The opposite is hypothermia, which occurs when the temperature drops below that required to maintain normal metabolism. We get this question all the time. People think that just because it’s cold outside that placing any questionable infested item outside will kill bed bugs. The same goes for when it’s hot outside. Ninety-five degrees to us may be uncomfortably hot, but bed bugs flourish at that temperature. So, yes, no, and, it depends, is the answer. Let’s take a look at why. Yes, if the temperature was at zero degrees Fahrenheit and below and held long enough to affect the eggs and the bugs. Now if you lived in the Antarctica the answer would be a strong yes, absolutely, go for it! The misunderstanding of bed bugs causes so many people to do the wrong things when they discover they have them. We try very hard to educate our clients and the general public so they don’t make mistakes. So, if you place items out in the cold for a few days and bring them back in “thinking” it killed the bed bugs, think again. As you can see from the Bed Bug Temperature Chart, these low-temperatures are beyond just extreme. On the flip side, people have also asked if they placed items out in the sun on a hot day, will it kill bed bugs? Looking at the chart, you can see that the same applies to heat. The thermal death point for live bed bugs is around 120° F and must be held for a certain time. The eggs require an even higher heat. So, turning up your house heat can never get hot enough to kill bed bugs and will only give you a high electric or energy bill. Oh and, make you very uncomfortable. The possibility of bringing your household to zero and sub-zero temperatures to kill bed bugs is literally impossible. Heat effectively eliminates all stages of bed bugs. Heaters, heat the air and fans are used to create a vortex which moves heat into areas that bed bugs harbor. High temperatures are maintained for a certain required time (depending upon extent of infestation). An Infrared Spectrometer reads surface temperatures to assure surfaces reach lethal temperatures. Some environments with a greater thermal mass or excessive amounts of items take longer to heat then those without. This is known as the faster and most efficient way to get rid of bed bugs in one day versus chemicals which can take several weeks to a month or longer. After a short cooling of the environment, you can return to sleep without bed bugs in your own bed at the end of the treatment! Our detection dogs help pest control find bed bugs where they are hidden so they can target the treatment. Knowing exactly where bed bugs are hiding helps to concentrate efforts in those areas. We love it when our clients use heat versus chemicals. 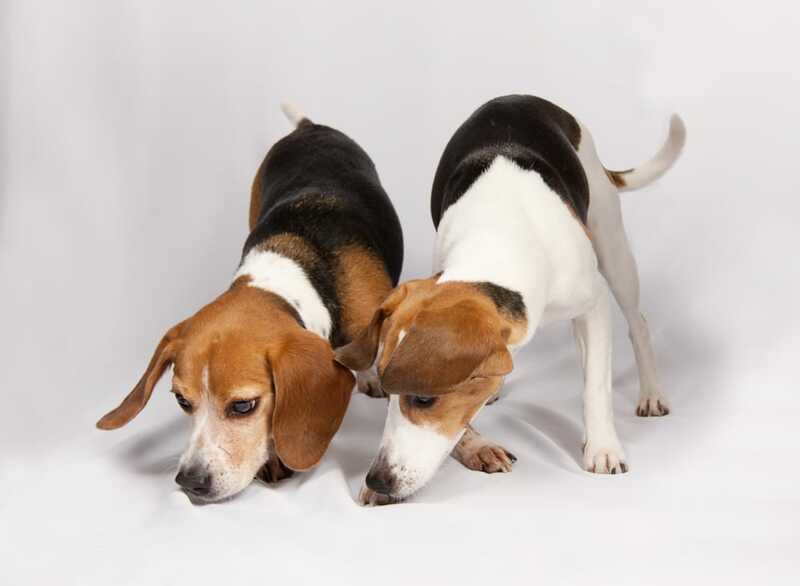 Dogs sensitive noses are harmed by inhaling chemicals just as people are. So, if you suspect you may have bed bugs, give us a call, we’ll find where they are hiding.